This observation set PKI 8035 and PKI 8040 allows the A/V observation from outside, i.e. through walls. With the silent drill PKI 8040, the almost silent drilling system, you can drill a hole having a diameter of 5 mm into walls up to a thickness of 40 cm. The special drilling system PKI 8040 is almost silent at the lowest speed. It is only necessary to remove the accumulated drilling residues from the special drill. The drilling residues are removed manually. Through the hole drilled this way, you can now introduce the PKI 8035 A/V microprobe and use it for observation purposes. 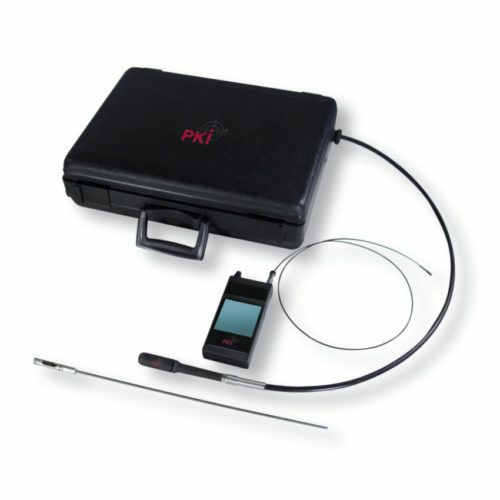 The PKI 8035 is designed as a modular system. The camera directly transmits the image data onto the 8.9 cm colour monitor. Optionally, wireless transmission is also possible. Power is supplied via a rechargeable Li-ion battery. Highly interesting is the video recording function on SD memory card (max. 16 GB); operations can be reliably documented and stored. Playback on a A/V Microprobe Ø 4.5 mm, Silent Drill larger monitor is possible via the integrated connection. The PKI 8035 disposes of a fixed focus function and a continuously dimmable LED light source. Power supply: 85 – 270 VAC (50 – 60 Hz) from mains or 12 VDC rechargeable battery with mains adapter/charger. for monitor, batteries, USB cable, hard-top case, instruction manual.